Manufacturer of effective plant growth regulators, based on 24-epibrassinolide with purity more 90%. 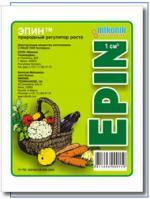 Specifications: Epin: -is the first representative of a new generation of agricultural chemicals with one of brassino,24-epibrassinolide, as an active ingredient; -acts in extremely low doses, which are comparable with the natural content of epibrassinolide in plants; -is ecologically safe, nontoxic in relation to human, mammals, useful insects and fish; -stimulation by epin of physiological processes in plants increases yield and quality of crops, diminishes disease injury, and enhances the resistance of plants to unfavorable conditions, such as drought, high salinity, chill, etc. Our company is specialized exporter, manufacturer and supplier of Plant Growth Regulator in United States.